My last blog about the Rosetta, Dawn and New Horizon missions was posted in July last year. Before I give an update, let’s first have a look at our Sun. Here is a recent graph of the number of sunspots. Cycle 24 has reached a maximum in April 2014 and is coming to an end. As you will notice, cycle 24 has a double peak, in itself not unusual, but this time the second peak is higher than the first one. The maximum of cycle 24 is much smaller than that of cycle 23, and the prediction for cycle 25 is that it will be similar to cycle 24 or even smaller. 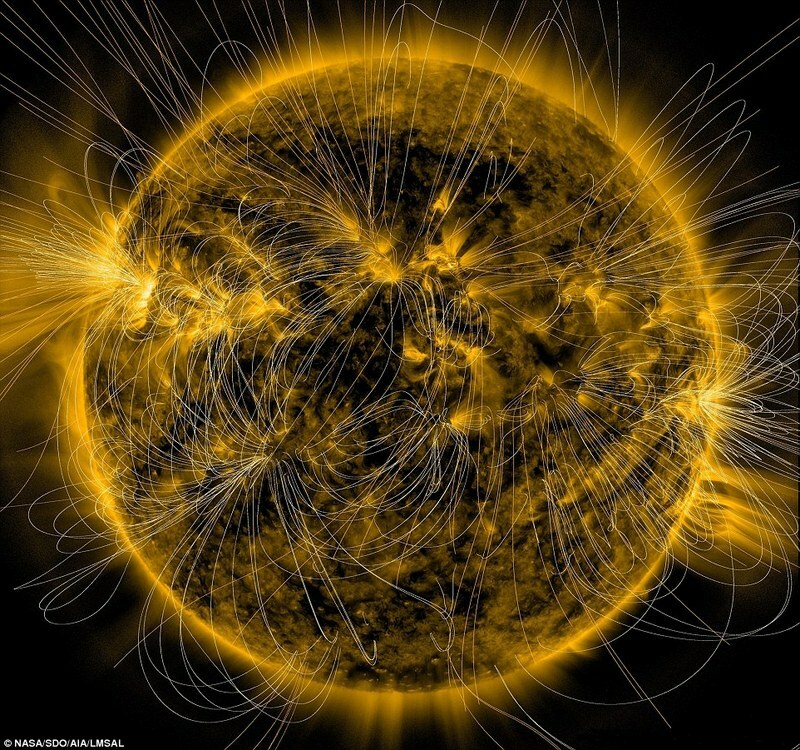 Here is a dramatic image of our Sun, taken by the Solar Dynamics Observatory. Magnetic field lines are superimposed. 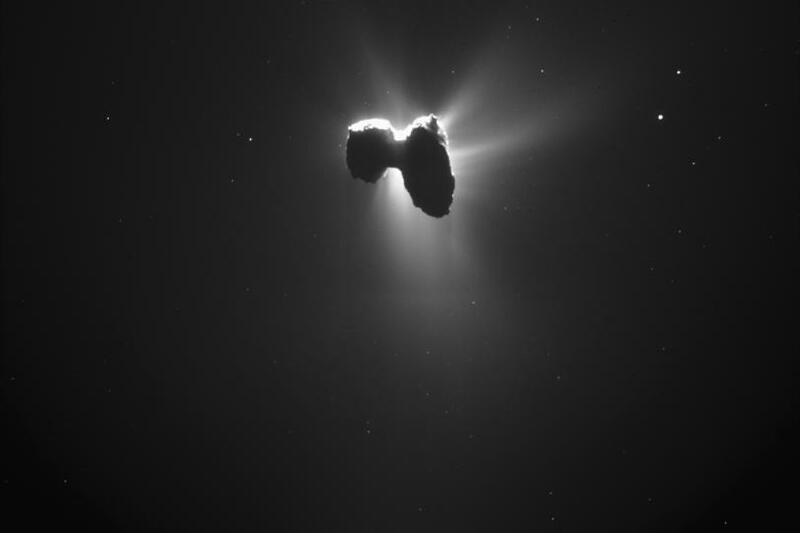 Rosetta is still orbiting comet 67P, which has passed its perihelion and is now on its way out into deep space. 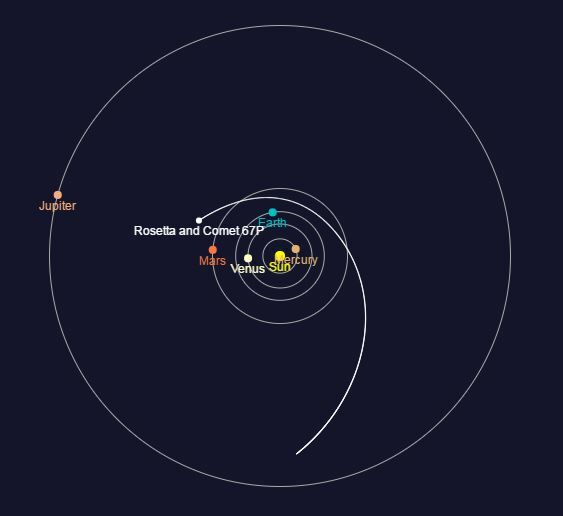 Here is the position of Rosetta and the comet, end of last year, the comet has passed already the orbit of Mars. No signals of the comet lander Philae have been received anymore, but Rosetta itself is still active. Here is a recent image of 67P, taken on 27 March, when Rosetta was 329 km away from the comet nucleus. The Sun is behind the comet, with a spectacular result. Here is the most recent picture (in false color), taken 30-3-2016 from an altitude of 385 km. . Spectacular. 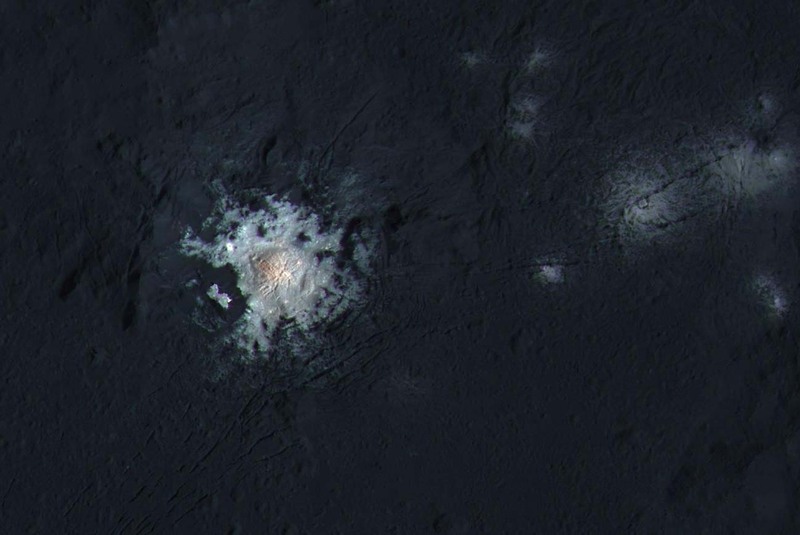 Scientists now think that the white spots are formed by highly reflective material, possibly ice or salt. 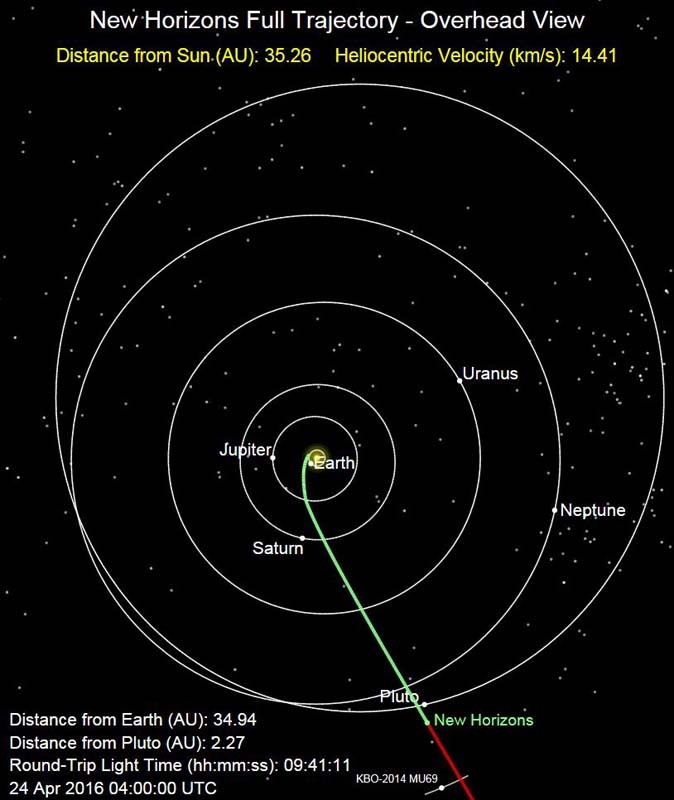 On 14 July 2015, the New Horizons spacecraft passed Pluto at an altitude of 12.500 km above its surface. 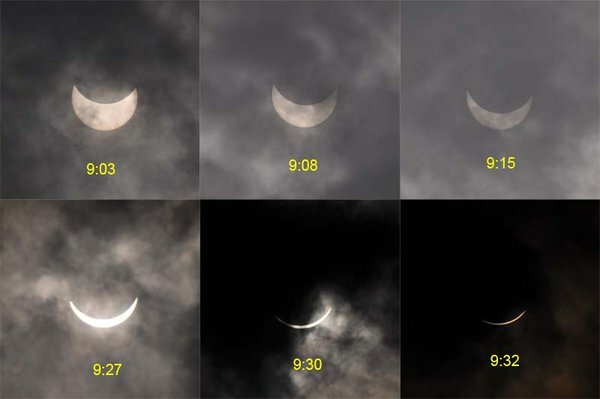 It took as many pictures during the fly-by (of only a few minutes!) as possible and it still has not finished transmitting all the data to Earth! Here is one of the images, released a few days ago. 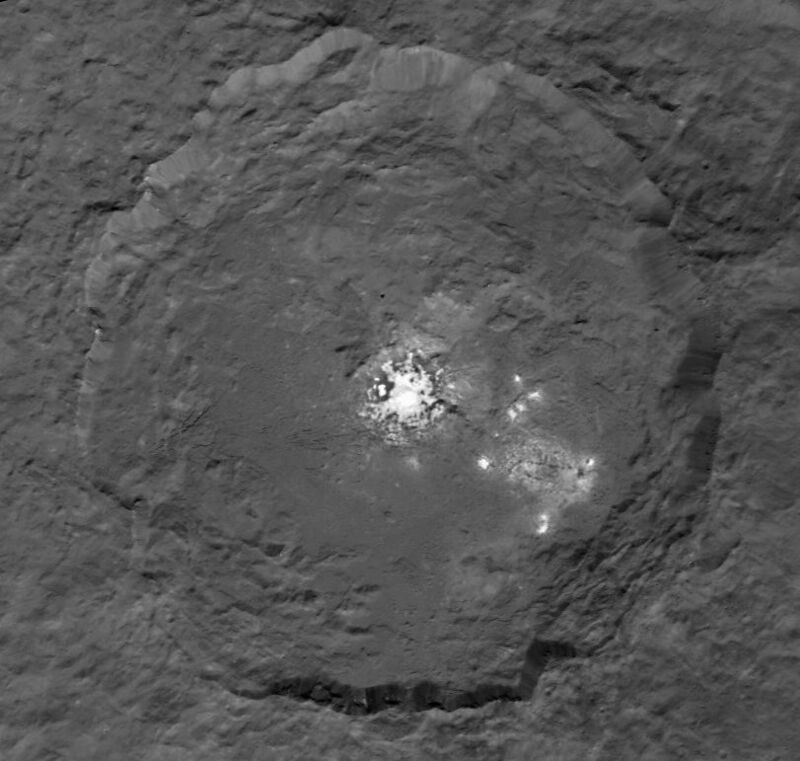 It shows numerous “haloed” craters. The false-color image gives the composition: purple is methane ice, blue is water ice. 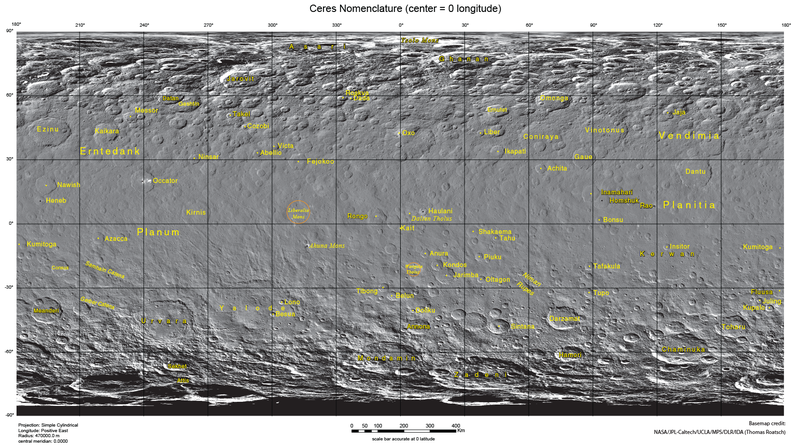 Why the crater rims and walls consist of methane ice has not yet been explained. We have reached the outskirts of our Solar System. Pluto, once the 9th planet, has been demoted and is now considered a dwarf planet belonging to the Kuiper belt. Recently more dwarf planets have been discovered in the region beyond Neptune, Eris ( in 2005) , Haumea (in 2004) and Makemake (in 2005) Like Pluto they have quite elliptical orbits and periods in the range of a few hundred years. Pluto for example has a period of 248 year and its distance to the Sun varies between 30 and 49 AU, where 1 AU (the average distance between Earth and Sun) = 150 million km. 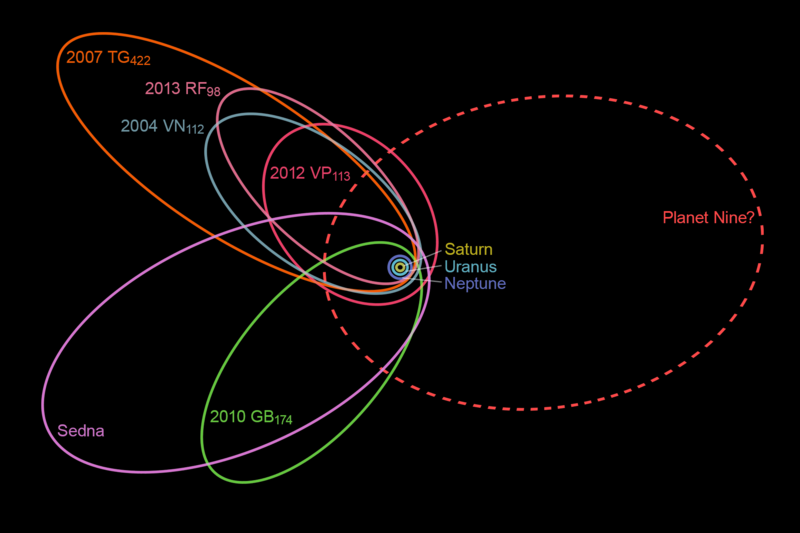 The orbits of these dwarf planets have been strongly influenced by big neighbour Neptune. In 2003 dwarf planet Sedna was discovered with an estimated period of 11.400 year and a distance to the sun varying between 76 and 936 (!) AU. 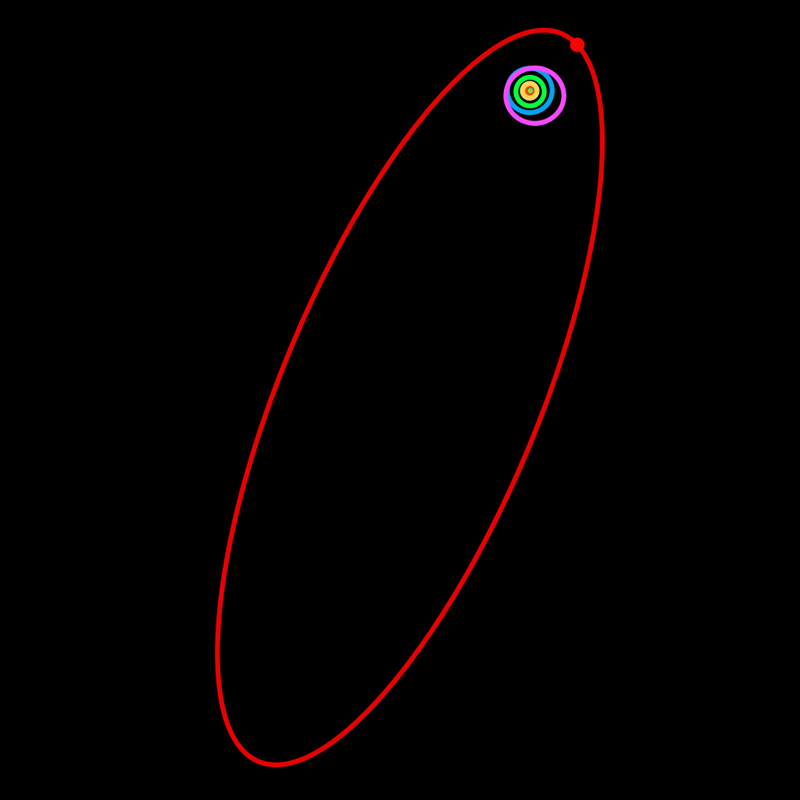 Here is the orbit of Sedna. 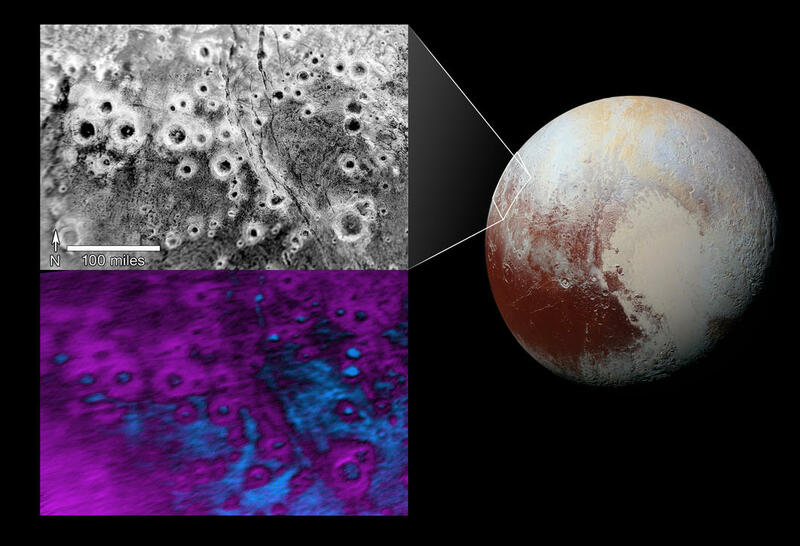 Pluto’s orbit is purple. What could have caused such an extremely elliptical orbit? It can not have been gravitational disturbance by Neptune, because it never comes close to Neptune (distance of Neptune to the Sun is 30 AU). In the last decade more of these “strange” objects have been discovered. 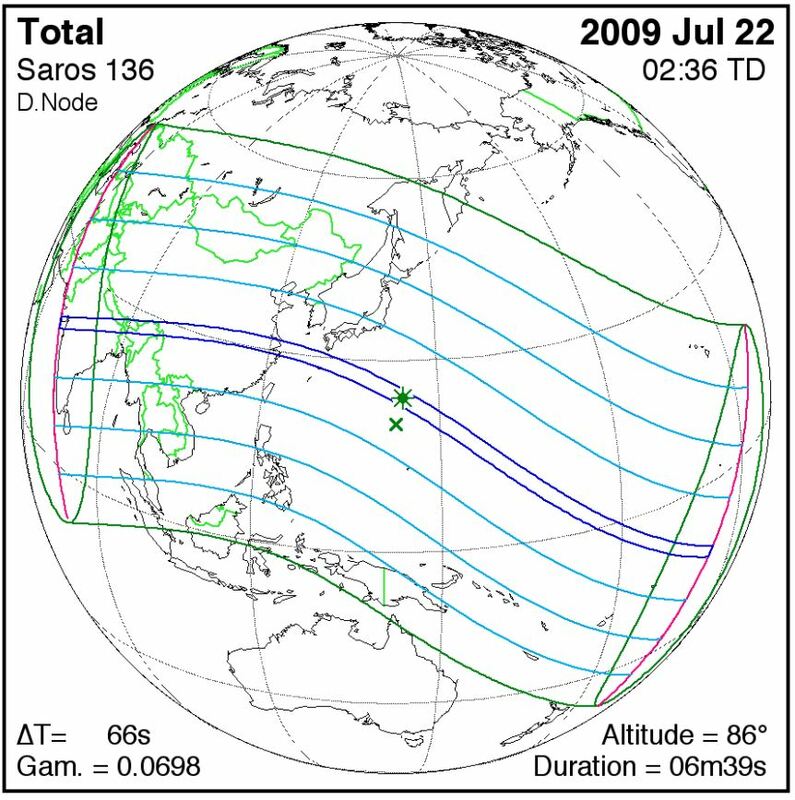 For example in 2012 2012 VP113, estimated period 4200 year, distance to the Sun between 80 and 438 AU, also very elliptical. Here the orbits of six of them are given. Could these orbits be gravitationally disturbed by an UNKNOWN planet in the outer reaches of the Solar system? On 20 January 2016 astronomers Brown and Batygin published an article in the Astronomical Journal: Evidence for a distant giant planet in the Solar System (abstract). Using computer models, they find that a planet with a mass about 10 times the mass of Earth, a period of 10.000-20.000 year, and a distance to the Sun varying between 200 and 1200 AU, could explain the orbits. Tentatively this planet is named Planet Nine . Here is a sketch with the position of this Planet Nine. Of course this is a hypothesis until now. Other explanations are possible. Next step is to try and find Planet Nine. That will not be easy, even for the most powerful telescopes. And where to look for it? Here is a picture of the two authors, both astronomers from Caltech. By the way, Brown (left) is the guy who discovered Eris, which started the demotion process for Pluto! They have started a website The Search for Planet Nine and just submitted a (highly technical) paper in which they discuss where to search for this planet. 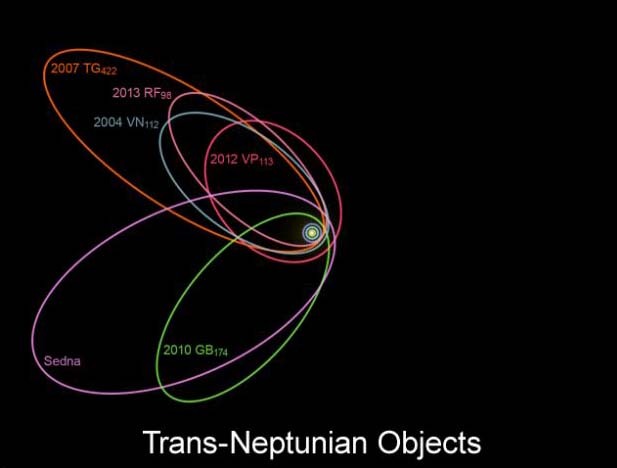 If Planet Nine is ever found, I will not be surprised if they get a Nobel Prize for their research. 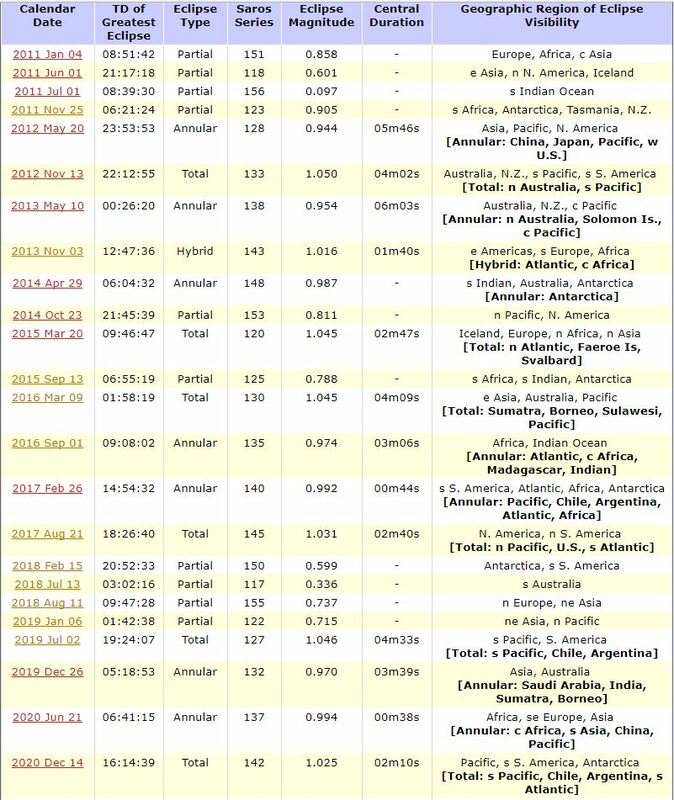 It is almost one year ago that I gave you an update about the Solar Sunspot Cycle 24. For those who have not read those earlier posts, a short recapitulation. 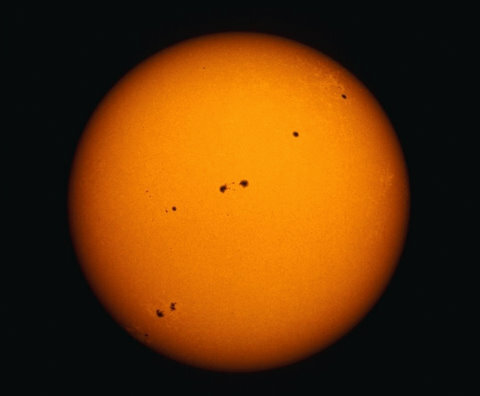 Sunspots are dark spots on the surface of the Sun and related to the sun’s magnetic structure. It is a periodic phenomenon, sometimes there are many, sometimes there are almost none at all. The period is about 11-12 years, and one such a period is called a Sunspot Cycle. As you see, the maximum is considerably lower than the maximum of cycle 23. And that is the reason that I have published my earlier posts, for example Don’t worry, our Sun is not dead. You can read more background information there. Here is a graph showing you the large variation in these sunspot maxima during the last 500 years. 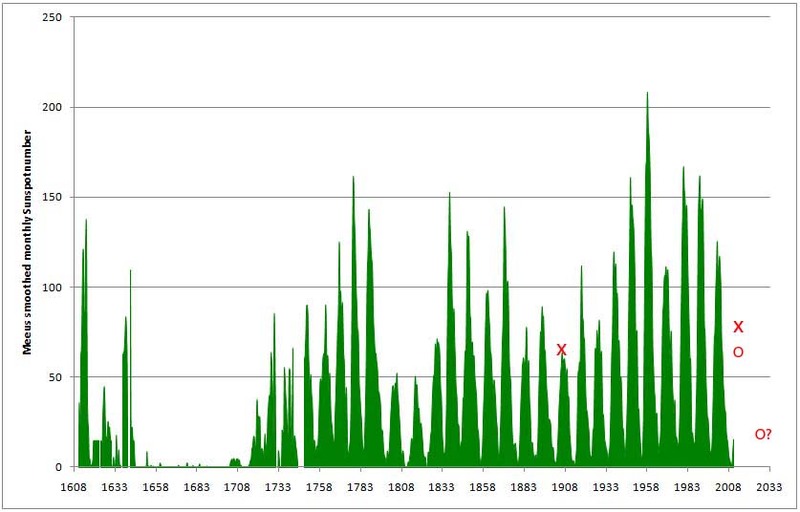 In the last 50 years the sunspot activity has been unusually high, whereas in the second half of the 17th century there was hardly any activity at all. This period is called the Maunder Minimum, whereas the last 50 years are sometimes called the Modern Maximum. Another period of low activity occurred in the beginning of the 19th century: the Dalton Minimum. The picture above I have used already in my post, one year ago, How is the Sun doing these days? At that time the prediction was that the maximum would be about 76 and I had marked this maximum with a red cross, comparing it with the low value of 64 in 1906. Now, one year later, we have reached the maximum and it is even lower than predicted, ~ 65 (red circle). Although it is a bit early, a few predictions have been made already for cycle 25, which will peak around 2024. Peak may not be the right word, because the maximum might be as low as 7! If we are going to a new minimum, will it be Dalton-like or Maunder-like? No one can tell at this moment. We do not really understand much of the underlying mechanism. When we study the Sun in visible light, it looks peaceful, with occasionally a few spots..:-). 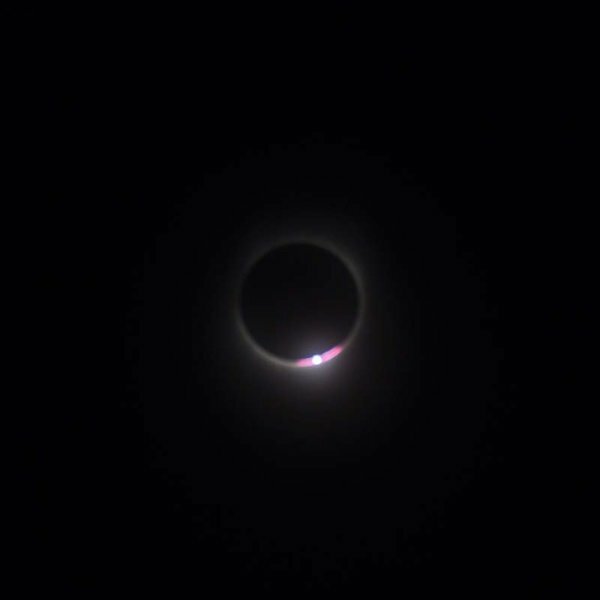 But look at the Sun in the ultraviolet region, and you see how violent it is. 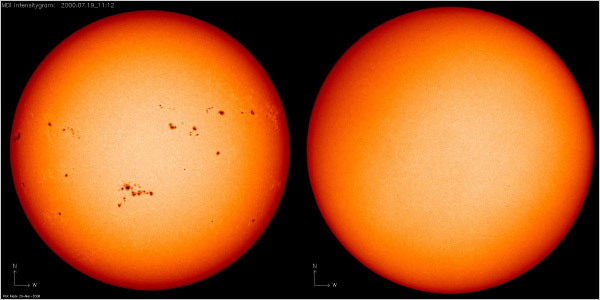 Is there a relation between the periods of large/small solar activity and the climate on Earth? 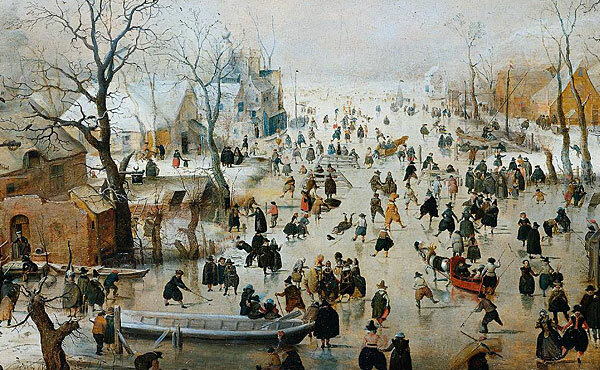 During the Maunder Minimum we had the Little Ice Age. Is the Global Warming fully due to the hothouse effect of carbon dioxide, or has the Modern Maximum also its influence? This is a sensitive topic, that I will not touch. The next decade we will hopefully learn more. 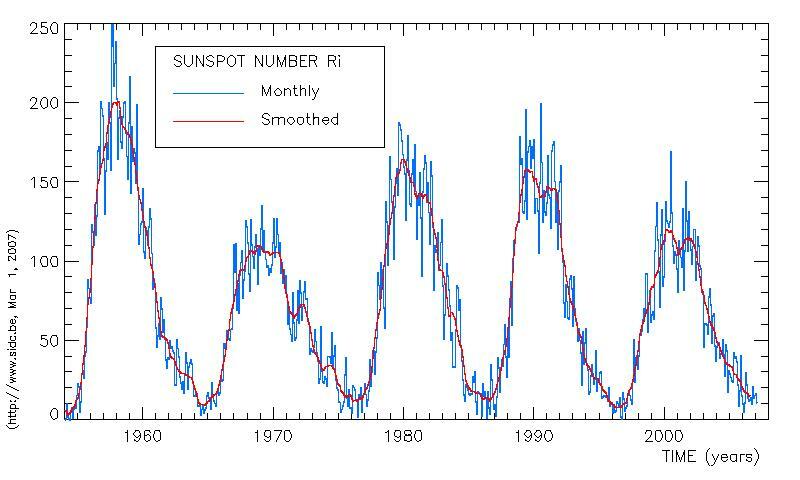 For more information, here is a very readable article in Sky and Telescope (published already two years ago): Is the Sunspot Cycle About to Stop? The Mayan Long Count calendar ended on 21-12-2012. 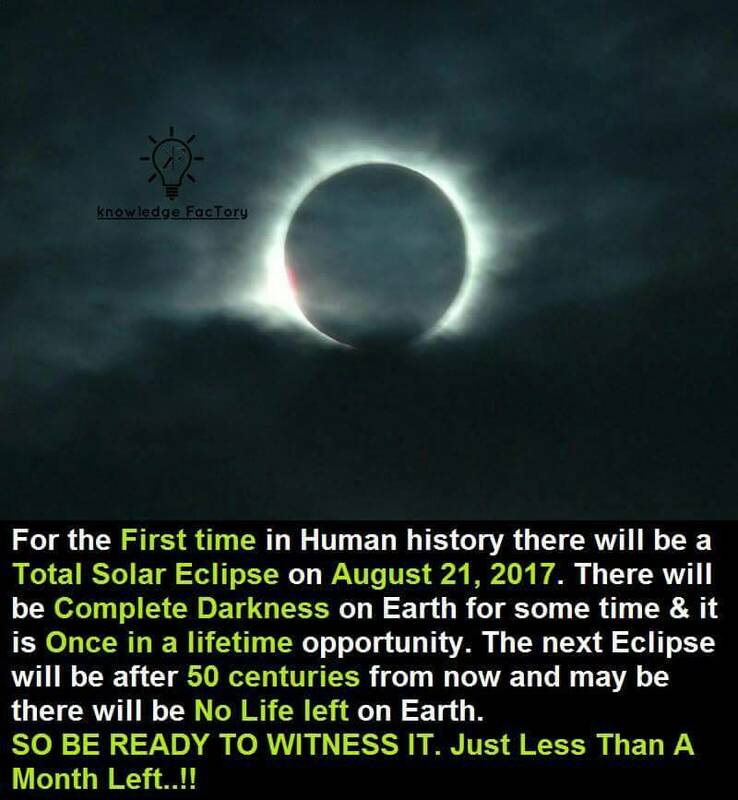 Actually it did not really end, but a new cycle started on that date. So 21-12-2012 can be seen as Mayan New Year’s Eve. The next one will be on 26-3-2407. 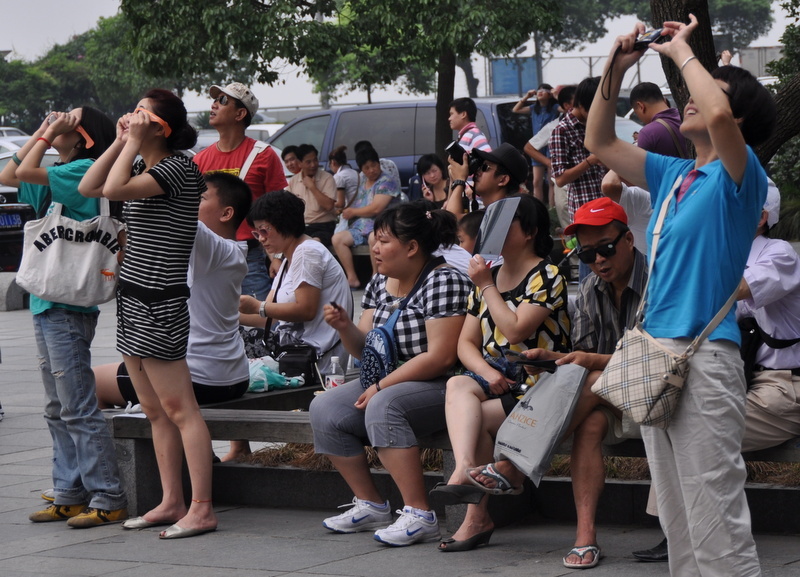 Quite a few people expected that the world would end on this day. Sad. Suddenly Nibiru would show up behind the moon and destroy Earth, or the magnetic field of Earth would suddenly reverse, etc. 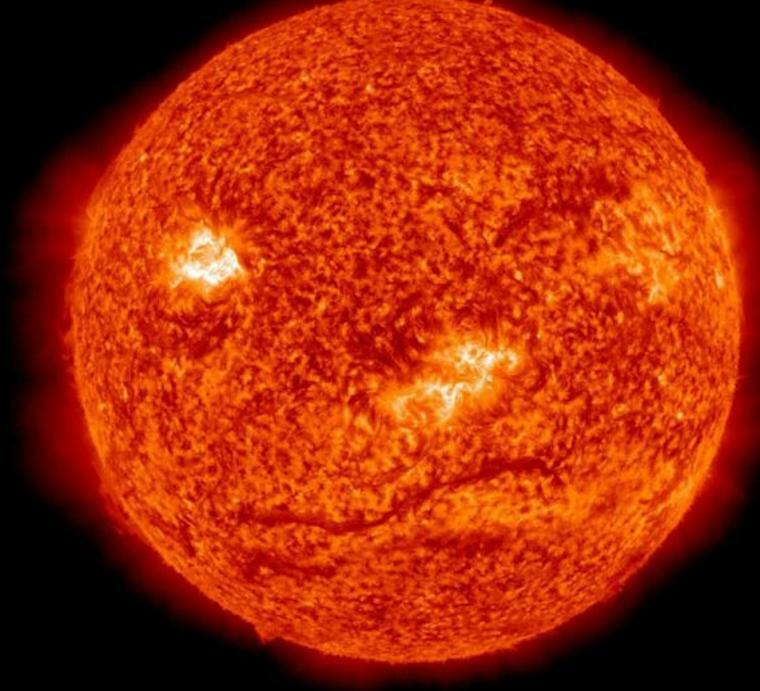 Here is a picture of the Sun, apparently taken just after “Doomsday”. It looks like the Sun is winking…:-). The picture comes from a recent newspaper article, personally I doubt if the picture is authentic, especially the “lips” I find suspicious. In the past I have published several posts about the Sun. It will reach a maximum in its 11-year sunspot cycle, next year. It is becoming clear now that this maximum will be very low. Here is a picture updated until December 2012. The expected maximum of around 72 will be the lowest since 1906. Nevertheless Michio Kaku , the physicist “who would kill his mother to get publicity” (quote by me, LOL) is warning about solar storms that might create havoc on earth. How is the Sun doing these days? 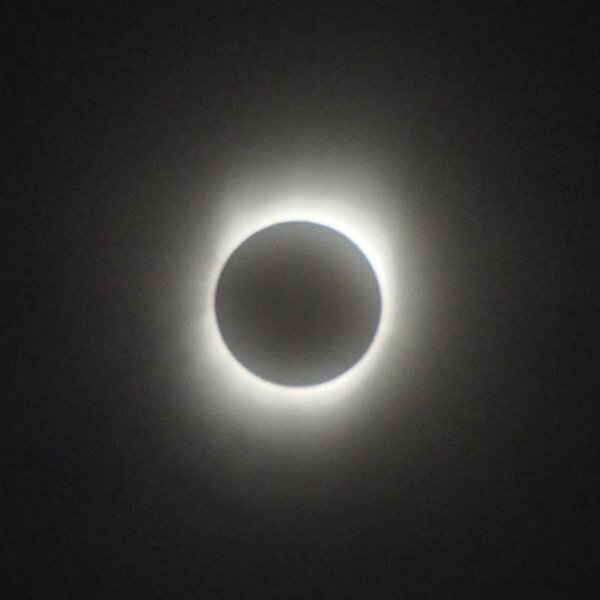 My last post about the Sun is from August 2010. At that time it had become clear already that the present Solar Cycle 24 would be a weak one. We are now two years further, the maximum in solar activity is expected around September next year. Time for an update. The current prediction is a (smoothed) sunspot number maximum of about 76. That is low! We have to go back to Cycle 14 in 1906, to find a lower maximum value of 64. Here is a graph of the Solar Cycles over the past four centuries. With red crosses I have marked the 1906 maximum and the (predicted) 2013 maximum. 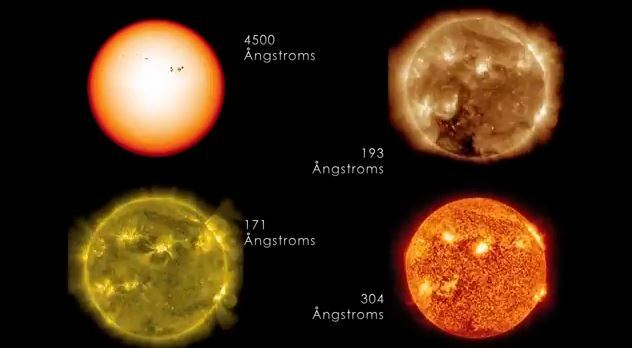 You will notice that the last half century we have had a “wave” of solar activity. Is that coming to an end now and will we enter a period of low solar activity? Nobody knows, as we do not understand very well the origin of the Solar Cycle. 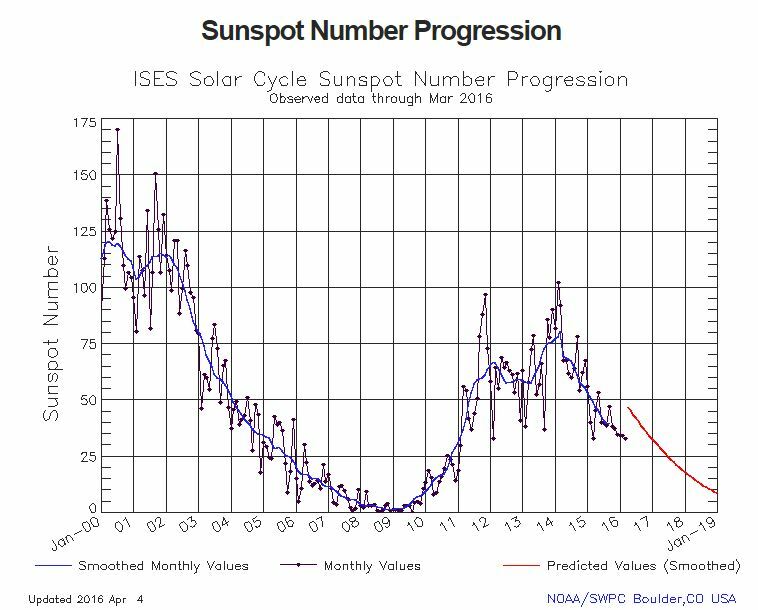 End of March I have added a post about the (lack of) sunspot activity on the Sun. Solar cycle 24 was so slow in starting, that some scientist got worried. The red curve is a prediction, made in 2009. When you look at the latest data points, the prediction seems too high, it should be adjusted. Actually this has been done last month, see below. This new prediction gives an even lower maximum, below 70 !! If this prediction comes true, we even have to go back to solar cycle 14, with a peak value of 64, in 1906. 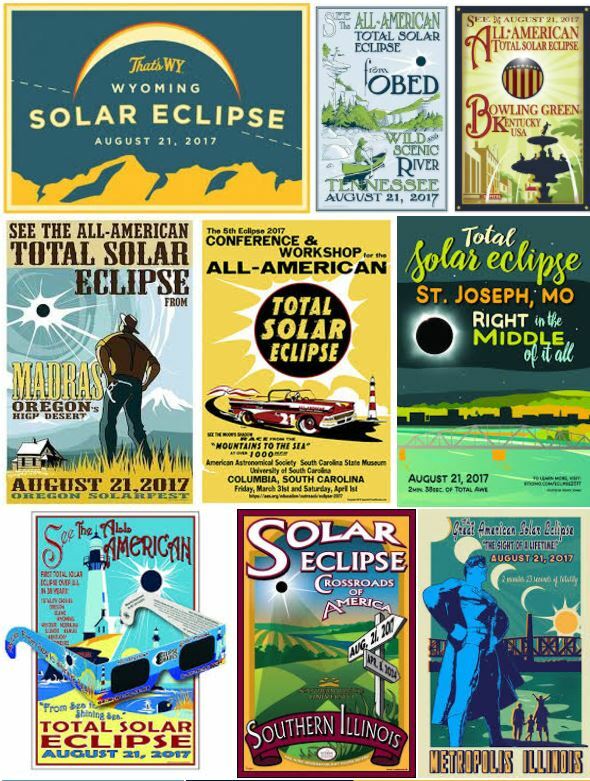 Click here for the list of solar cycles. 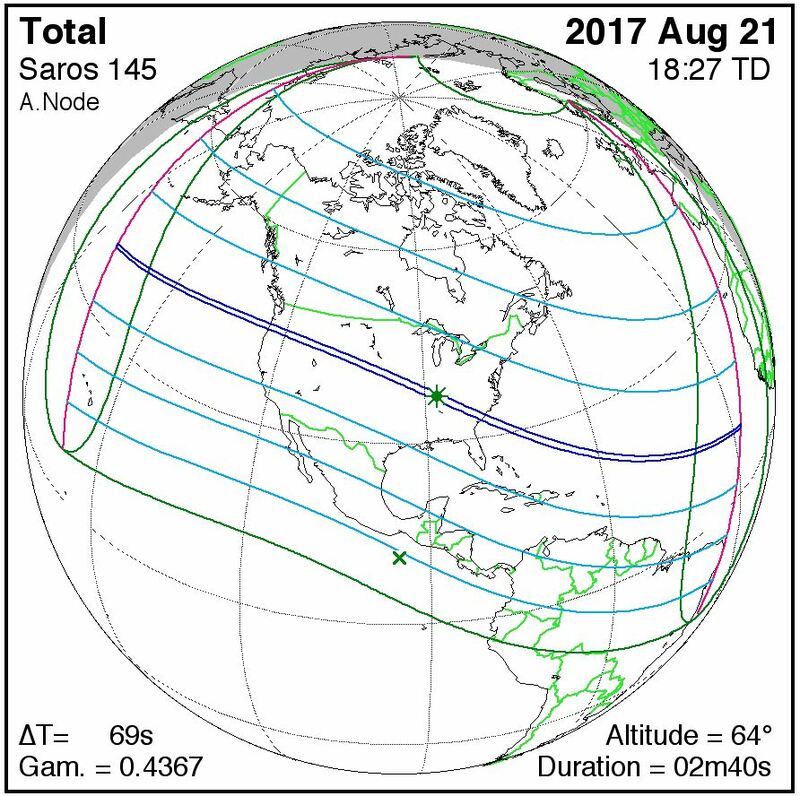 You can bet on it that solar scientists are following the development with great interest. I will give you another update in a couple of months.